Coorg Coffee Camp is situated a the most peaceful and serene location surrounded by nature, coffee plantation. Coffee Camp is a perfect location for those who want to stay in a serene and peaceful environment. 2 Independent Cottages are Exclusively for Couples or Families. Reservation Process: Check the calender to see if the dates are available. If so, you can go ahead and make the reservation. 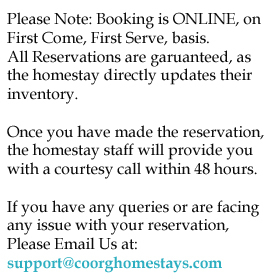 Once the guest completes the reservation, the homestay owner is alerted by the system. Your book is confirmed in real time as the inventory is updated by the homestay directly. Place is good. Its very peaceful and surroundings are beautiful. Staff here is cooperative and friendly. Add some north indian variety in food, specially breakfast. Good atmosphere and great service. Locality is a great plus. Caretaking and responsiveness is on-time and effective. The stay was awesome, Location is very rustic and serene. Rooms are spacious and very well maintained. There are some cool places to visit nearby too, like the Thirvenalli Templs, Mrithunyajaya Temple, Nagarhole National Park, etc. Staff is courteous. Madhu is very informative and provided us with good travel tips. Our kids also loved the place and nature too. Good experience, best value for money. As location of Coorg Coffee Camp is very good. Ambiance, Rooms are neat and clean. Food quality is also very nice. We will suggest our relatives and friends. Owner of this property Mr.Madhu is very cooperative to fulfull expectations. Very quite and relaxing. Good size property. Food was good. Madhu and ganesh were very helpful. Thanks for the cordial and friendly stay. Had a very good time with the family. Hospitality and surroundings are good. Get a feeling of personal touch. Great to spend time in their place. Excellent service provided. Madhu organized everything perfectly. Very approachable staff. Good Food. We liked the location and place. Enjoyed the place and very nice hospitality. Weather was amazing. Ganesh helped us a lot and all the host were very courteous and hospitable. On suggestion, if I may - please place a dustbin in the rooms, which would encourge the guests to keep the place clean.